The Cordless 9.6V Hand Blender – Simple and elegant, this powerful, portable, hand blender can mix just about anything you want, anywhere you want. 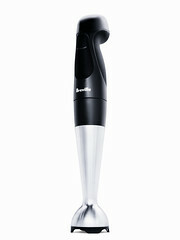 From soups to marinades to your favorite iced drink, it’s the powerful little anything mixer that can get the job done. 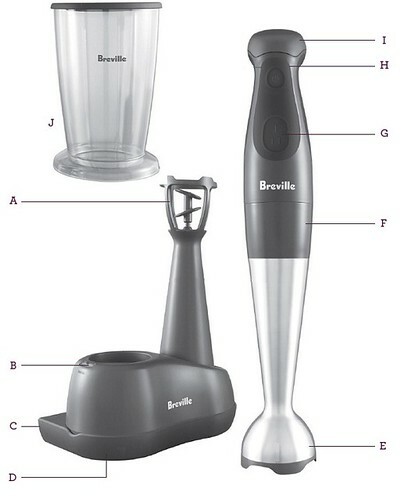 A.Smoothie Attachment B. Charge Light (red for charging/ green for fully charged). C. 360° Charging Base. D. Optional Wall Mount. E. Stainless Steel Ice-Crushing Blades. F. Detachable Stainless Steel Shaft. I. 9.6V Battery. J. 34 oz Mixing Jug with Storage Lid/Non-Slip Base.